An event is essentially anything with a start and end date or time: a course, a retreat, a workshop, a teacher training, a festival etc. Posting your yoga event on YogaTrail is a great way to get the word out among your students and in the yoga community. You can also accept bookings for your event, manage invitations, or get YogaTrail to help with marketing. Posting an event uses up an event credit ( premium profiles have unlimited credits). You can buy these, but you can also easily earn free event credits for your profile, too. Go to the main dashboard of the profile you want to organise an event from. There, find your Events Section (using the left navigation, or click on the "Events" block). Click "Add Event". That will take you to a series of forms where you can provide all your event details. Fill in your event information in the various tabs you see. Some info is required (marked with an asterisk, *), some is optional... but the more information you supply, the better! Your main image is especially important — it should be attractive and of a good resolution. Click "Save & Publish" on the bottom of the last tab. If something's wrong or missing, you'll get an error message, and you'll need to fix the problem. If you leave the page or forget to click "Save & Publish", all your information will be lost! 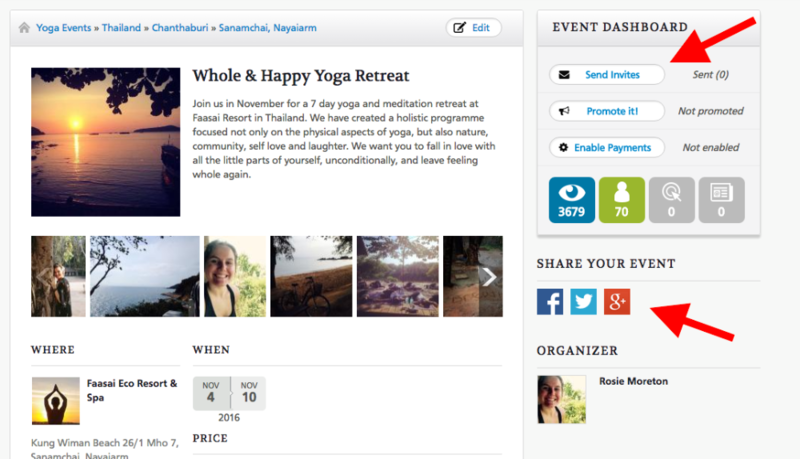 Next to 'Save and Publish' button, you'll see an option to 'Notify Yogis about this event'. Leave this option selected for all your followers and students to get a notification announcing your new event. If you don't successfully "Save & Publish", your event is not saved, and all your information will be lost! If you've enabled payments on YogaTrail*, you can use the YogaTrail Booking platform to accept bookings and payments for your event. If you already created your event before having payments enabled, don't worry: you can always come back and edit your event to set up bookings later. With booking enabled, you'll find options to create various packages and set the number of spots for each to be made available for sale on YogaTrail. Note: if your the available spots are 0 or not set at all, that package won't be available for yogis. With each booking, the available spot number is decreased. You also get immediate notifications when someone books something. Commissions: You pay 7% Platform Fees when one of your students or someone coming in from one of your invites books your event. If you get a booking from someone with whom you had no previous connection, YogaTrail collects an additional 7% "finders fee". Pro, Premium, or Global profiles never pay any commissions. *Not available in all countries, unfortunately. YogaTrail's Booking Platform uses Stripe — to see if it's available in your country, check here. After posting your event, you'll land on the event page, where towards the right, a "mini-dashboard" will show you options to send out invites to your event, to get YogaTrail promoting your event (paid feature), and you'll see some insights into how many people have seen your event, too. Below that, you'll see buttons for sharing on social media - use them! YogaTrail can also promote your event, either in the area where it will be happening, or all around the world. Promoted events are featured on the website, the YogaTrail mobile app, and in email newsletters reaching hundreds of thousands of motivated yogis. (All events organised by Premium or Global profiles are automatically promoted in this way, but you can also purchase singe event promotions without upgrading your profile). Why is my event expired already? Events expire after their start date (since people usually can't join something that's already in progress). If you want to create something that's ongoing in some way, you'll have to create a separate event for each instance. Generally, it's best to post and advertise many weeks before the event date. For something like retreats or teacher training, most people are looking for such things many months in advance (4 months on average). How do Events affect my classes and schedule? Events will not interfere with other things on your schedule or calendar. For example, if you post an event that overlaps with your classes, you need to cancel class yourself if you want people to not come to class. The time interval of your event will also not affect your availability for private lessons or appointments. What are Event Credits? How do I get some? Posting an event requires an event credit (unless you have a premium profile, which have unlimited credits). You can buy event credits on your events dash board, but you can also easily earn free event credits for your profile, too: you get1 credit for every 10 followers on your profile, every yoga professional you invite to YogaTrail, and every 5 reviews on your profile, too.